No matter what you are looking for with your roofing requirements, whether you have a commercial or domestic property, Best Roofing Services are here for you. We are ready to offer you high quality, professional services in Wolverhampton and the surrounding areas so don’t hesitate to get in touch. If you need roofing experts in your local area, you are in the right place with our experienced team. With more than 25 years of experience in all styles of roofing for both domestic and commercial clients, you can count on us to get the roofing you need at affordable prices. At BRS, we provide a full range of roofing and guttering services. From flat roof repairs to full new tiled roofs and everything in between – we do the lot. With over 25 years of roofing industry experience, Terry and the team at BRS are on hand to give you advice and make sure you make the right choice for your home. Getting the roofing right on your home is paramount to having a well insulated and well protected home and it is one of the most important investments you can make in your property. Unfortunately, there are a number of roofers out there that lack the necessary skills, knowledge, experience and workmanship to provide a quality long lasting job. So be sure to do your homework before you employ a local roofer – always check their reviews and get testimonials as to the quality of their work. If you are interested in finding out how BRS can help you or you simply need a little bit of advice for your roof project – then get in touch with Terry today on 01902 662 029. Why Choose Best Roofing Services? With over 35 5 star reviews on Google and a further 27 5 star reviews on our Facebook page, we are the number one rated roofing company in Wolverhampton by a mile. 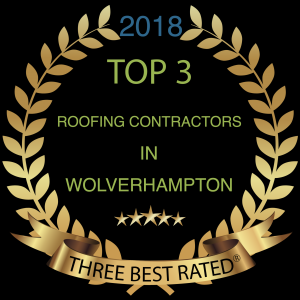 Not only do our customers rave about our quality work that is provided at an affordable cost, but we are also the Best Rated Roofer in Wolverhampton according to threebestrated.co.uk. We pride ourselves on the quality of our work and providing a quality roofing service at an affordable price. Paying a reasonable price should not mean that you have to compromise on quality so when it comes to the most important aspect of your home – your roof – don’t settle for second best and don’t pay over the odds. Choose Best Roofing Services – the number one rated roofer in Wolverhampton. Forget the rest and try the “best”, get in touch with our team by calling 01902 662 029 and speak to us about your needs. We are ready and waiting to start work at your property so don’t hesitate to get in touch. No matter what you are looking for with your roofing requirements, whether you have a commercial or domestic property, Best Roofing Services are here for you. We are ready to offer you high quality, professional services in Wolverhampton and the surrounding areas so don’t hesitate to get in touch.